Chaitanya group’s business commitment to certification and quality is of the highest priority. All our production facilities are ultramodern and adhere to global quality manufacturing requirements. Our facilities are currently under process for expanding in-house DMF Chaitanya encourages client audits and advocates working in a transparent business environment. Our experience and focus on product development extends to cover a wide range of bulk drugs, nutraceuticals, mineral complexes for health food supplements, pharmaceuticals, animal feed and agriculture formulations. Today we offer end-to-end solutions, from bulk drugs to nutraceuticals and large volume potentials. Our expertise are approved from Food & Drug Administration (FDA) Department in production, microbiology & chemical analysis. Our expertise extends to understanding these compounds and suggesting applications towards making improved formulations and combination products to meet your specific business requirements. We constantly work towards quality enhancement and process optimization to enable better product yields, thereby helping us pass on a huge cost advantage to our customers. We offer a wide range of nutraceutical fortification products, including organic mineral amino acid complex that help food technologists match the demands of today's consumers for environmentally safe health products. All our products offer enhanced safety, bio availability and best in class excellence. 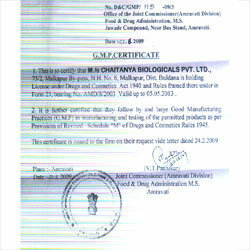 Today Chaitanya is the prime supplier of choice for several leading pharmaceutical and Food, Biotech, Agriculture companies across the globe due to their reputation for quality and continually high standards of service and extremely competitive pricing. Due to our 20 year plus experience our propriety process and our strategic alliances. Chaitanya offers its customer best-in-class prices whilst maintaining quality standards that few manufacturers can boast of. Quality products combined with perfected expertise to offer global clients an one-stop-shop experience for quality health supplements and formulation ingredients. Regular internal audits occur of the food safety plans. Audits are performed by staff with adequate education, training and operations experience. Routine environmental monitoring is conducted for pathogens. The location and frequency of the sampling plan is documented. The company operates a retention sample storage program for finished products and ingredients used. Retentions are kept at least until the stated expiry date.